Low avalanche danger continues in the mountains of Turnagain Pass. The snowpack consists of weak shallow snow with pockets of unreactive wind slab at higher elevations. Freezing rain and warming temperatures are the big weather news for today. Those changes will likely not cause much change to the bigger picture in terms of snow stability for today. 1 Low Alpine / Above 2,500' Travel Advice: Generally safe avalanche conditions. Watch for unstable snow on isolated terrain features. Anchorage School District schools are closed today due to dangerous driving conditions and freezing rain. Be safe on the roads if you plan to head to the mountains today. If I had to pick one of our avalanche problems to talk about a primary concern, then wind slab would be the one. We have not seen any pockets with a tendency to pop under the weight of a person. Even in the places where stiff surface snow can be found, it has a stubborn, low tension nature. In areas that are not exposed to wind, the snowpack is 15-30 inches of weak faceted snow. The cold and clear temperatures combined with shallow snow have formed a steep temperature gradient and changed the snow to big sugary crystals. The snowpack is shallow... Exposed rocks and vegetation are abundant. That lack of coverage is probably the biggest safety concern for skiers and snowboarders in the backcountry right now. It has been nearly a week since significant snowfall. Cold temperatures and clear skies gave way to a big change yesterday, but not the white stuff that we were hoping for. Temperatures at some ridgetop weather stations are above freezing this morning. 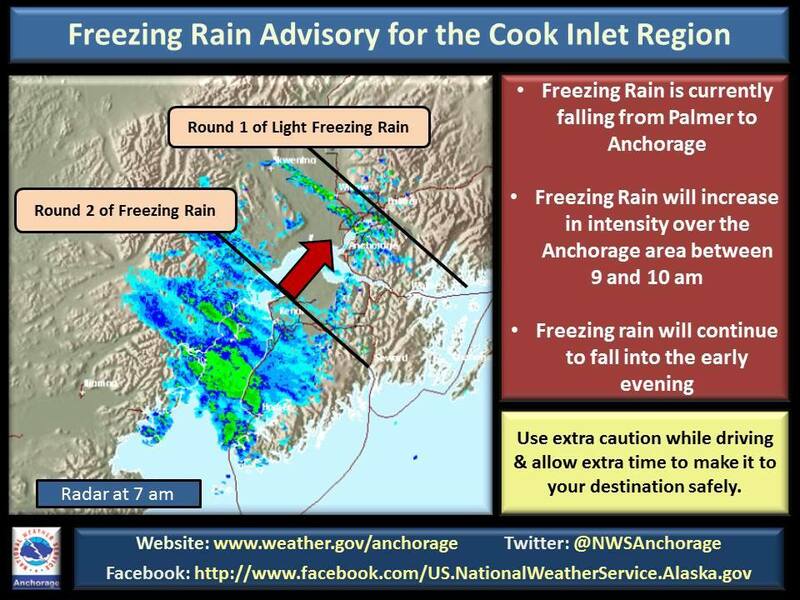 A freezing rain advisory is in effect for Anchorage and the greater region, including Girdwood and the Kenai peninsula. Driving conditions deteriorated yesterday evening with a slick glaze of ice on the roads, and that freezing rain will continue today. Freezing rain is expected to form a surface crust on our snowpack. This isn't an avalanche concern for now, but may become a weak layer interface when the crust gets buried by later snow storms.